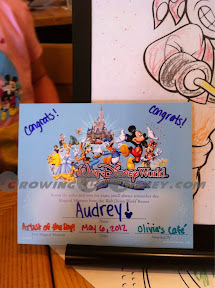 After checking in at Old Key West, we sat down to lunch at Olivia's. 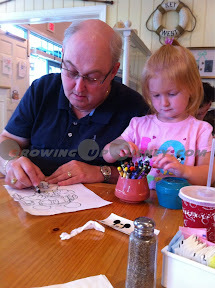 DisneyDad and Tink had fun with the coloring pages and crayons. One of the Cast Members came over and chatted with Tink and asked her name. 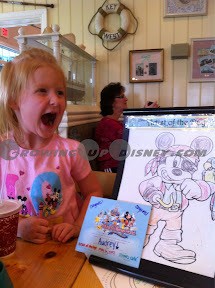 Then she came back a few minutes later and asked if she could have the Mickey Tink had been working on. I knew something was up and convinced the little one that it was ok. Shortly thereafter, another Cast Member called for everyone's attention and announced Tink as the "artist of the day" and presented her with a cute certificate. When we left, the coloring page was on display at the hostess' desk. 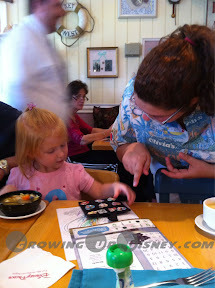 And if that wasn't enough fun, Tink was given her choice of princess pins. She chose Tiana. Princess and the Frog is very popular at our house. 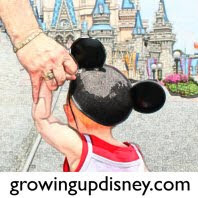 Truth be told, DisneyDad was the real artist today. 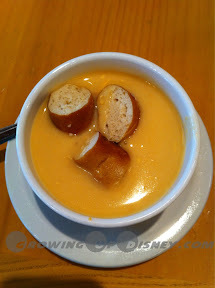 And it has nothing to do with crayons, but the soup of the day was cheddar ale with soft pretzel slices. It was quite good and different than everyone's favorite Canadian cheese soup. This one was lighter, without bacon, and a more pronounced flavor from the ale.